GRACE YOURSELF. : Organizing Nail polishes. I love girly things, and one of those things are nail polishes. I have many of my own, but with my best friend leaving to the military this past January, I was able to inherit her collection of nail polishes. I have about 87 nail polishes... can you believe it? Many times, I have a hard time picking out a specific color I want to apply on my nails. I've been really wanting to organize my nail polishes and all of the colors somehow, so that it would be easier for not just myself but for my friends to look and pick out. I was at Daiso a while back, and I found these fake nails that you're supposed to glue on as if they were acrylics and paint on top of it with whatever color polish you want. That's when the idea of using them like they use the round nail display thing at the nail salon came into my head and it was like a lightbulb that just went off. I started this really late at night only to find out that I wasn't going to be able to sleep well if I didn't finish all of it. So despite the fact that I had to be up really early the next morning, I sat down and finished all of them. This is my finished product. I tried to color code them as much as possible, and it's such a joy for me to look at my work and pick out the color of polish I would like to apply on my nails. For in the case that I am not able to find the exact nail polish, I labeled every nail on the back portion with a sharpie. I don't know why but I can't help but be pleased at this idea and it would've been a lot better if they were the sturdy round ones like the ones they have at the nail salon but I wasn't about to order them from Ebay (because I don't use paypal...) which I think turned out fine thanks to Daiso. 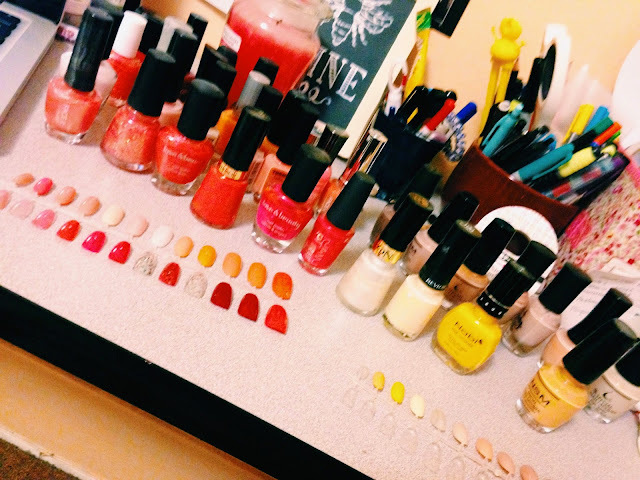 Do you have any great ideas of how to organize nail polish colors?